Cinemagraphs are a combination of video and still photography, visit web thumb usually more of a photograph with some motion. The term cinemagraph was coined by Jamie Beck and Kevin Berg. Cinemagraphs are actually animated gifs, no rx which have been around for a long time, but they have a cinematic quality and retain the feel of a photograph. A photographer friend of mine, Jenny Chen, was visting Vancouver so we decided to collaborate on a photoshoot and use the opportunity to try to create some cinemagraphs. It was the first time either of us had tried this. I followed an excellent video tutorial, which demonstrates how to create cinemagraphs using Photoshop CS5 Extended. Have you tried creating a cinemagraph? Feel free to post a link in the comment section! Bokeh is normally created in-camera by using a shallow depth-of-field and focusing on the subject and allowing the other parts of the image to become blurry. For this shot I wanted to create a glam look by adding some bokeh in Photoshop. First I retouched the photo, smoothing the skin and removing any blemishes. There are a variety of ways to do this - here is one short step-by-step example. I added a blank layer above the top layer, and selected a hard-edged round brush and set the foreground colour to white. I wanted the brush to paint a bunch of random circles so I went to the brush window and selected "shape dynamics" and moved the slider for "size jitter" to around 30%, selected "scattering" and checked "both axes" and moved the slider to around 480%, "count" to 2, and "count jitter" to around 30%. FInally, I selected "other dynamics" and changed the "opacity jitter" to 10%. You might need to play around with the settings to get something that looks good for you. I then painted the layer with a few strokes. I added a layer effect - "gradient overlay" and used white for the foreground colour and some gold from the lips for the background. It was a linear gradient with an angle of 118 degrees, and normal blend mode. Finally, I adjusted the layer opacity to 67%. I then added another blank layer above this, and painted some more circles, then I used the Gaussian blur filter to make these blurry. You will need to play around with the radius that best works for you. 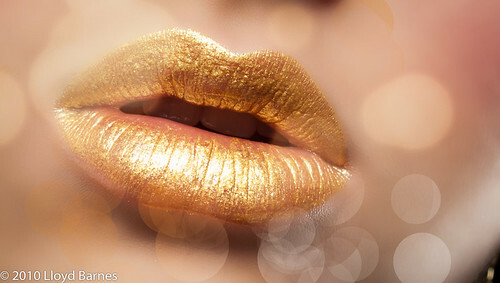 I added some layer effects - "outer glow" and used the eye dropper to grab some gold colour from the lips, and changed the blend mode to screen. I also used "inner glow" with a light yellow colour (ffffbe). I used a levels adjustment layer, clipped to this layer and lightened up the bokeh circles until they glowed a little. 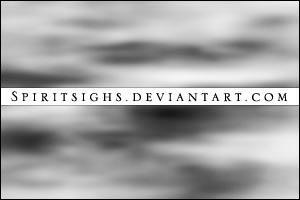 I then changed the layer opacity to about 50%. Finally, I used a curves adjustment layer above all the other layers to tweak the contrast of the overall image. Here's another tutorial for creating an awesome digital bokeh effect.